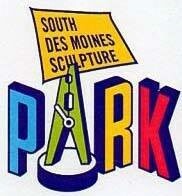 Two men with a vision created the South Des Moines Sculpture Park & South Des Moines Art Festival. The South Des Moines Sculpture Park is located at the corner of SW 8th & McKinley. In the 1930’s & 40’s, The Des Moines Railway System’s trolley cars used this location as a stop. This narrow strip of land became an eyesore. Southside residents Chuck Mettler and Phil Barber decided to purchase the land and they began cutting the weeds and grass, trimming the trees, and removing the trash and debris from the property. These two citizens funded the project on their own. They have created sculptures and try to add a new sculpture or 2 each year. These two friends not only create these sculpture’s, they have created The South Des Moines Art Festival. Barber and Mettler share their artistic talents and their passion for art with their community. 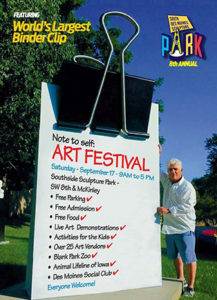 The South Des Moines Art Festival is a yearly event in September. For dates and more information on this event, please visit the South Des Moines Sculpture Park and Art Festivals Facebook Page.